How to freeze credit. These days, it seems as though no-one is safe from data and security breaches. Even Equifax, one of the three main credit-reporting bureaus, was recently affected by a substantial breach that affected millions of Americans. With all the potential security risks out there, now is a good time to make sure you understand how to go about freezing your credit quickly. Hopefully you’ll never need to take this action, but if you do, you’ll be happy you know what to do. 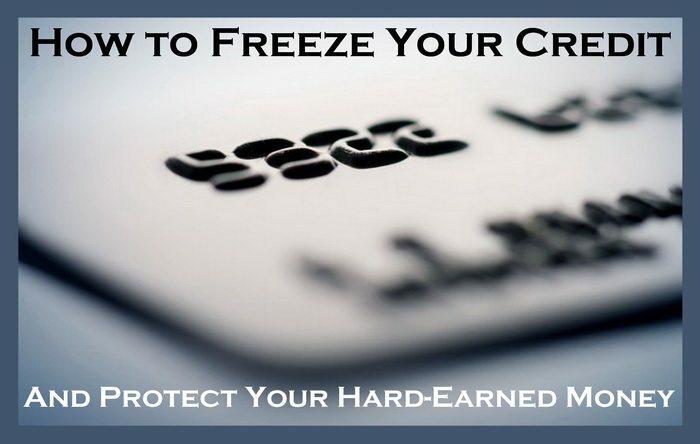 How to Freeze Your Credit – Protect Your Hard-Earned Money! Specifically, a credit freeze refers to an action you can take on your credit report. When you freeze your credit, this prevents lenders and creditors from obtaining a copy of your credit report or score until further confirmation has been provided. This confirmation could come in the form of a password provided by you, or you could forego a password and require a creditor/lender to contact you personally via telephone any time a request for your credit report has been made. In most states, a credit freeze will remain on your report until you personally contact each credit bureau to remove it. In some states, however, a freeze will automatically expire after seven years. There are three major credit reporting bureaus in the United States, and unfortunately, you will need to notify each bureau individually that you want to place a freeze on your credit. Keep in mind that some credit bureaus also charge a small fee for placing a freeze on your credit, so you should include this fee with your mailing where applicable. If you are a victim of identity theft, you may be able to have this fee waived. If time is of the essence, you may also be able to have your credit freeze placed over the phone. More than likely, you will be asked to fax or e-mail proof of identification if you go this route. Keep in mind, though, that during times following a major security breach (such as the Equifax breach earlier this year), you may experience long waiting times due to heavy call volume. In these situations, it may make more sense to send your credit freeze request via snail mail instead. Hopefully, placing a freeze on your credit is something you’ll never need to do. However, in the event that your information may have been compromised, knowing how to act quickly and get a freeze placed on your account could just save your credit score and finances from being wrecked. For more information on protecting yourself from web data breaches and freezing your credit, contact us using the comment section below. Previous post: How To Fix a BIG Hole In Your Drywall – FAST!